Our Chicago trademark attorneys provide entrepreneurs, inventors, start-ups, small businesses and private companies with a full suite of state and federal trademark legal services. To read more about a particular trademark service, please click on one of the links below. 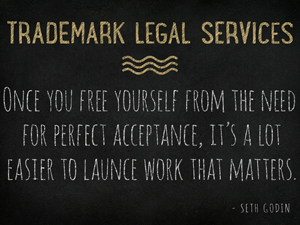 For additional information about our law firm’s trademark services, please contact our trademark attorney. Trademark search and analysis for new products, services and business names. Performing a trademark search is critically important before any start-up, entrepreneur or business selects a new product, service or business name or design trademark. The primary importance of the trademark search is to determine if your proposed trademark is available for use. Without conducting a proper trademark search, you are flirting with financial disaster or, worse, dealing with a trademark infringement lawsuit. Trademark registration, maintenance, and renewal of trademarks in the United States and worldwide. Filing for federal trademark registration provides numerous trademark benefits to business owners and entrepreneurs. Our trademark law firm offers an flat rate fees for the majority of our trademark services to make it affordable for any entrepreneur, inventor or business to take advantage of important federal trademark benefits. In addition to registering your trademark, it is equally important to renew existing registrations to ensure continued protection. After a trademark registration issues, to keep the registration valid, the trademark owner must file specific renewal documents and pay fees at regular intervals between the 5th & 6th years after the trademark registration date and again between the 9th and 10th years after the initial trademark registration date, and every 10 years thereafter. Failure to renew your trademark will result in the cancellation of your registration, leaving you trademark(s)unprotected. State trademark laws allow for state trademark registration of trademarks for individuals, entrepreneurs and businesses who are local and do not use, sell, offer, advertise or promote the goods, products and/or services beyond the borders of the State of Illinois. Any enforcement action for state trademarks occurs in Illinois courts according to its state laws. Trademark monitoring services to deter potential infringement of your trademark registrations. Once a trademark owner holds a trademark registration, the trademark owner is subject to several legal responsibilities. Of primary importance is the legal responsibility to actively police the registered trademark in the marketplace to deter potential trademark dilution and trademark infringement. Failure to police the registered trademark and notify those potential infringers may result in the complete loss of certain federal trademark rights. To ensure retaining maximum trademark rights under law, our law firm provides quarterly trademark monitoring services for an affordable annual fee. Trademark filing, trademark application preparation, and prosecution of new trademark applications. Filing for federal trademark and obtaining a successful trademark registration provides numerous benefits to a business owner, entrepreneur. These benefits include nationwide trademark rights, right to sue in federal courts, ability to recover money, use of the ® symbol, deterring others from using your trademark or similar trademark, ability to stop cybersquatters from using your trademark in domain names, etc. To determine whether your business should seek federal trademark protection, please contact our Chicago trademark attorneys for assistance. Providing responses to issued USPTO trademark office actions. If the USPTO examining attorney has any concern with your application he or she will issue a notice called a Trademark Office Action. Many times the examining attorney will simply request additional information regarding the trademark. However, more often than not, the examining attorney will reject the trademark application by issuing a reject or refusal. The most frequent bases for rejection are likelihood of confusion with an existing registered mark and genericness or descriptiveness of the mark for which registration is sought. Our attorneys have extensive experience in responding to all different types of rejections and refusals. If you have a state or federal trademark matter or issue, please send us an email, fill out one of our contact forms, or give us a call at 312-789-5676.